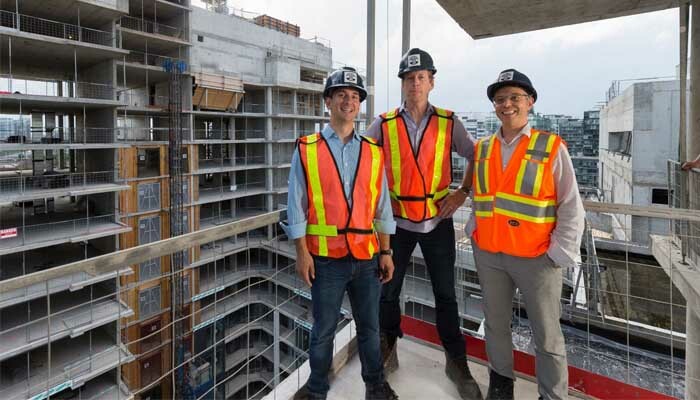 Sep 5, 2018 – [Toronto, ON] – Minto Capital Management Inc. (“Minto Capital”) recently held a topping off event at 39 Niagara (“The Project”), a purpose-built rental tower under construction in Toronto, Ontario. Employees and investors gathered on the building’s 14th floor on Thursday, July 26th, 2018 to celebrate the completion of the steel construction phase of the project. Paul Baron, VP of Asset Management (Minto Capital), Glen MacMullin, SVP of Investment Management (Minto Capital) and Frank Pagliuca, VP of Construction (Minto Communities) standing in front of 39 Niagara rental offering. While the north side, 39 Niagara ("Niagara West"), is being offered as an apartment and retail development opportunity, the site also includes 690 condominium units as part of the building at 27 Bathurst - currently 99% sold with the remaining 9 units going on sale in 2019. Leasing opportunities for retail space are currently available. Occupancy for the condominium tower is expected to start in February 2019. Rental units will be available starting July 2019. Register to receive updates on rental opportunities as they become available here. Minto Capital Management Inc. (“Minto Capital”) is the investment management division of The Minto Group, a fully integrated real estate enterprise established in 1955 with expertise in asset management, property management, development and construction. With 1,200 employees across Canada and Florida, the company has built over 85,000 new homes and currently manages 8,800 multi-residential units and 2.5 million square feet of commercial space. Minto Capital’s $2.5 billion portfolio (as of June 30th, 2018) is comprised of proprietary capital as well as private equity funds and joint ventures with institutional partners.